Trails 1 – 3: 20 cm base w 2cm of new snow, machine groomed granular, no mechanical track-set. Well traveled on trail #1. Generally, good conditions for skiing and snowshoeing. Trails 4 & 5: 15 cm machined base, 2cm on new snow: well traveled at the trail heads. General conditions fair to poor for skiers but good for hiking. The Pond Rink and skater’s warm-up shelter are open. Rink surface condition are excellent. The weather outlook for this week supports another weekend of winter programs. 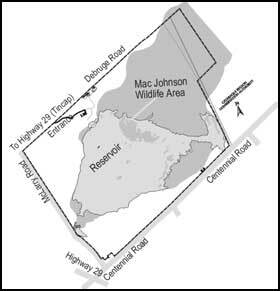 Located north of Brockville, just two km from Highway 29, Mac Johnson Wildlife Area includes 532 hectares of wetland, field and forest. The reservoir located on this property maintains water levels for the Buells Creek System which flows through the Township of Elizabethtown-Kitley and the City of Brockville. The reservoir is also a Class 1 provincially significant wetland with a high diversity of plant and animal life. Also known locally as the Back Pond, the Wildlife Area was renamed by the Cataraqui Region Conservation Authority in 1987, to recognize the efforts and achievements of a Brockville resident and early Conservation Authority member Mac Johnson. 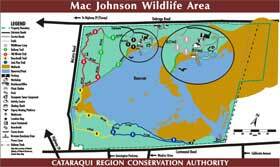 The Friends of Mac Johnson Wildlife Area is a local group of volunteers that help to maintain and promote the area. If you are interested in joining please call (613) 345-1990. 11km of trails cross woodland, wetland and field areas. The Wildflower Loop (trail 1) has been developed as an interpretive trail. Picnic tables, a large picnic shelter, a group firepit, barbecues and handicapped washrooms are available on the north side of the reservoir. A small picnic area is also located on Centennial Road near the Broome-Runciman Dam. A canoe access point is located on Centennial Road near the dam. A skating rink is maintained on the pond when conditions permit. A skating shelter and a bonfire pit are available beside the pond. Contains picnic tables, a woodstove and washrooms. It is available for rent by education and community groups. To make a booking call (613) 345-1990. Provided on site by the CRCA. Get more details about our conservation education programs for area schools. In the late 1700s and early 1800s, mills were an important feature in the settlement of southeastern Ontario. They cut lumber for carpentry and ground grain for food. Mills required water to provide the energy for operation procedures. Therefore, the early settlements developed adjacent to bodies of water. Brockville is no exception to this pattern. Buells Creek, with its potential for providing power to operate mills, attracted settlers to the area. William Buell, after whom the creek was named, was a merchant who settled at the mouth of the creek in 1784. Buell’s activities opened up the area for further settlement, settlement which led to the development of Brockville, and in which Buells Creek played a key role. At one time, Buells Creek supported eight mills, these being Brockville’s first industries. As a result of the mill ponds which were located along Buells Creek in the early 1800s, the water level of the creek was quite high. The marsh, at the headwaters of the creek, was also dammed to supply water for a mill, bringing its water level to a height comparable to or above the current level. With the end of the milling era in the late 1800s, the headwaters of the creek were given over to a new industry. It was officially known as “Peat Works” and was operated by a Mallory family. The marsh was drained, and the extraction procedures began. However, the operation soon ran into financial difficulties and was abandoned. After this initial drainage of the marsh, further drainage was attempted, to enable the area to be used for agricultural purposes. It was discovered, however, that much of the marsh was unsuitable for grazing due to the land’s lack of solidity. According to local accounts the land remained very wet and mucky after draining, and heavy objects would sink into the mud as if it were quicksand. Many horses and cows were reported lost in this manner. The Cataraqui Region Conservation Report (1968) states that the area was “found to be a ‘floating bog’ as far back as 1958.” This “floating bog” interpretation, if correct, would explain this phenomenon. In 1967 the Broome-Runciman Dam was built to regulate the flow of water in the Creek. From 1966 to 1970, the CRCA bought the lands around the Buells Creek area that today form the Wildlife Area. The properties were bought from a variety of vendors including, Mallory Estate, Wood Estate, H. Wordon, Wright Family, Brown Family, Fitzpatrick Family, Warren Family, McLarry Family, DeBruge Family, Stewart Family, Elizabethtown Township, Smith Family, Reynolds Family, V.L.A., Campbell Family, and the City of Brockville. Also known locally as the “Back Pond,” the Wildlife Area was renamed by the CRCA in 1987, to recognize the efforts and achievements of a Brockville resident and early Conservation Authority member, Mac Johnson. is located on Debruge Road, east of Tincap, 4 km north on Hwy. 29 from Hwy. 401 in Brockville.